Yeah I would cut those cards, as the main point of the deck by what you are doing so far is to play cards from your opponent. Having an artifact sub theme is good, but in the way in having mana and accelerating your boardstate. You can also add in a Master Transmuter to protect or cheat out your artifacts as well. With paradox engine out on the field you can gain an incredible amount of mana, so I would focus on tutors as well as card advantage. Engines like Mystic Remora as well as Necropotence will be great, the latter being said though would require a good mana base to get the triple black efficiently. Cantrips are also good for filtering and card draw, some staples include Ponder , Preordain , Brainstorm for the basic one drop spells. If you don't like one shot cards than run more effects like Windfall to refill your hand. Some additional cards that would be great for Sen are also cards like Delay , Remand , Unsubstantiate , Evacuation , Hurkyl's Recall , Snap . All of these types of cards allow you to remove threats and play them again when you take control of their hands. For recursion based cards you also have cards like Argivian Find , Argivian Archaeologist , Hannah, Ship's Navigator, Faith's Reward in the case of people popping everything or preventative measures. You can also consider a subtheme of adding in planeswalker, as they are generally hard to deal with, and especially with the next set coming out, there are plenty of great choices to choose from. Delay specifically grants the spell suspend and gives it counters. When the last time counter is removed, it'll be cast again, triggering anything that looks for when spells are cast, and allowing different modes to be chosen. 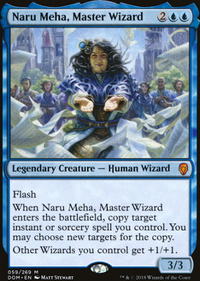 Additionally, Delay will trigger things like Baral, Chief of Compliance that look for spells being countered, while Ertai's Meddling doesn't actually counter the spell. Let's say you're casting Golgari Charm , and have a Demon's Horn on the battlefield. When you cast Golgari Charm , you gain 1 life from the Horn, and choose "Destroy target enchantment." 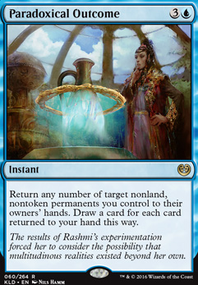 If your opponent uses Ertai's Meddling on your Charm, with X=3, then you exile it with 3 delay counters on it. At the beginning of each of your upkeeps, you remove a delay counter, and when you remove the last, you move Golgari Charm back to the stack copying the previous choices made. You aren't casting it, so Demon's Horn doesn't trigger, and since it's copying the previous version, you can't choose one of the other two modes, only destroying a target enchantment. Now let's say your opponent used Delay instead. It's countered, first off, so something like Baral will trigger. Second, it's exiled with three time counters and gains suspend. 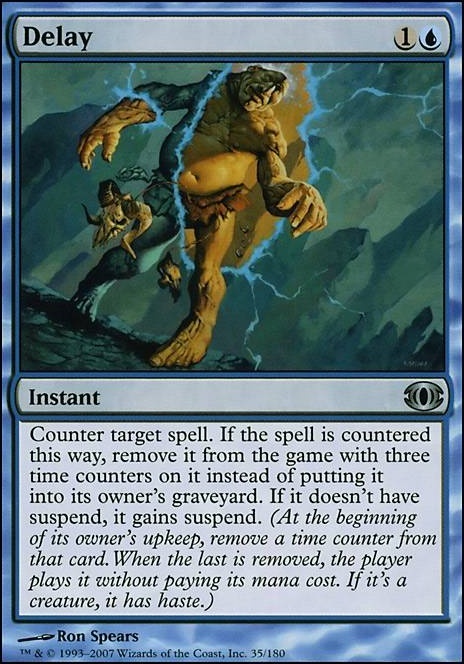 Again, you remove counters at the beginning of each of your upkeeps, and when the last is removed, you cast the spell without paying its mana cost. You can choose a new mode and/or new targets, and it will trigger Demon's Horn again. If your spell was Bond of Agony instead of Golgari Charm , then Ertai's Meddling allows it back on the stack with whatever value of X you'd previously used. Delay , on the other hand, makes you cast it without paying its mana cost, which means X must be 0. Thanks, but I'm still not sure I properly understand the card/rules. Comparing to Delay , since Ertai's Meddling (or the copy) doesn't have or gain suspend, I take it there's some differences? Yeah Path is probably not a good choice cause you’ll want to stay UB for the more reliable lands. I’d just go with blacks famous “cruel control” of Collective Brutality , Inquisition of Kozilek , Thoughtseize - remove the threats before they even exist. The upside here is that some combination of those cards will almost certainly guarantee the game goes until at least turn 5/6 without fail. 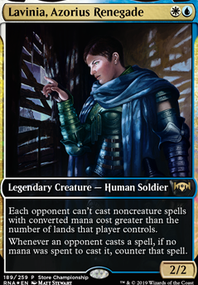 My only concern with Ashoik is that it, as well as Leyline and Relic, take up a lot of space - getting any more than 1 of these cards is probably a bad time as far as self-card disadvantage. If you’re doing more hand disruption, then perhaps maindecking some Nihil Spellbomb instead of Ashiok could be viable? As far as you get to draw a card, still exile stuff, and screw over the 80% of the meta doing graveyard stuff. IMO Ashoik just seems like too little value (but obviously i haven’t played this deck so i could be very wrong here). I missed the cool Delay interaction - that is actually very cool! Hey, wallisface, first of all, thanks for the input. 1) Yeah, i've been thinking about that, I've had interations where i splash some white for a Path to Exile , but manawise it gets too complicated. Maybe some more black cheap killspells, i'll think about that. 2) Ashiok, Nightmare Weaver works towards the maintance of the exiled cards, so the processors can "process", 3 mana, exile 3. 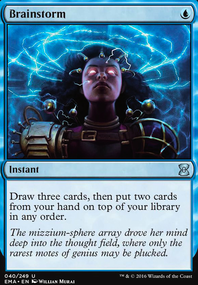 Jace, the Mind Sculptor is more of a way to control topdecking, with a focus on the 0 ability. 3) Delay is there, again, to power the processing mechanic, since when it occours, i should have creatures to exile it. 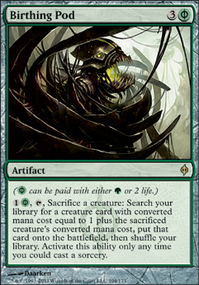 4) The Dimensional Infiltrator works with Ashiok, Delay, and the other mechanics for processing, i'll get 3 free creatures when i cast it, it IS a truck in late game. Not only that, i can sac the creatures to get mana. What do you suggest i trade them for? 5) The urza lands are a joke, i forgot to remove them. If you want to keep the "Nope Pope" in the command zone that's fine, he's a great commander, but you might take a look at Baral, Cheif of Compliance and Naru Meha, Master Wizard as alternative commanders, Belive me they are REALLY strong control decks and have combo wincoms capable of ending the game on the spot. As for Azorius, cut down the planeswalkers and add more spot removal + counterspells, Arcane Denial and Mana Drain (if you have the budget, try Delay if you don't!) are great counterspells that can swing the game in your favor! Path to Exile can get rid of an annoying creature or combo piece and the life gain normally won't matter in the end. Also, you're using Rest in Peace combo it with Helm of Obedience for more fun! I can't quite figure out what your Protean Hulk line is, but maybe I'm just missing it. Sinister Sabotage and Unwind both seem quite weak at 3 mana, especially considering the amount of lands you play that come in tapped. Maybe some combination of Delay , Remand , or Unsubstantiate . If you're looking for hard counters, Void Shatter I would put above Sinister Sabotage. Unwind might be fine for that purpose, but I'd weigh it vs the pros and cons of Overwhelming Denial . I really like Wilderness Reclamation here. Big brain plays. Yo Jayd0nlink, first thing I would recommend would be to cut down the amount of high CMC cost spells. I would also run a lot more interaction magic such as Remand , Silence , Delay , Capsize , and stax type cards that would prevent them from playing more cards. Some cards that come to mind are Aven Mindcensor and the likes. I would also use cards like Paradox Haze to get more use out of Sen Triplets when she is on the battlefield. Rebuff the Wicked and Imp's Mischief are alternative cheap ways to protect your commander. There are a lot of ways to synergize your commander with the playstyle you want to do. However big drop spells should be the first thing to do, after that you will need mana accelerators as well as protection spells, before using utility spells to get rid of cards you wouldn't like to deal with. Feel free to ask for more help as I did play Sen for quite a bit!